The Brexit negotiations provide a perfect example of how not to negotiate - and, as we all know, we learn so much more from our mistakes than from our successes. The scope of the negotiation was the departure of the UK from the European Union, following a referendum in the UK in 2016 when, in a high turn-out (72.2% of those eligible to vote), 17.4 million (or 52%) voted to leave the EU while 16.1 million (48%) voted to stay. The UK establishment was shocked and stunned. In the campaign before the referendum, the entire UK state apparatus had been used to argue that leaving the EU would be an act of serious, if not fatal, national self-harm. When the result of the referendum was announced, the EU Commission was equally perturbed as were the leaders of the member states of the EU. If we exclude Greenland (a part of Denmark), no member of the EU had ever left the union. To the EU, the UK's decision to leave seemed perverse. They were deeply disappointed at the damage the UK would cause. The EU would lose the UK's substantial annual net contributions to the EU's financial resources, and the prestige of having as a member of the EU the world's fifth or sixth largest economy, a permanent member of the UN security Council, a nuclear power and the EU's only member to be part of the Five Eyes. The EU was not happy. UK Objective: Despite much sympathy for the EU's views in the UK Parliament, the UK Government declared that it accepted the result of the referendum and set leaving the EU as its objective. This meant extricating the UK from the political and judicial institutions of the EU (i.e. regaining control of our borders, our laws and our money), while seeking a free trade agreement with the EU. EU Objective: It was clear from the start that the EU's objective was to ensure that it would be evident to all that any member state which decided to leave the EU would have a difficult time. There is strong anti-EU sentiment in the population of several member countries, and the EU Commission was determined to demonstrate that any country which tried to leave would pay a high price. Ideally they should be persuaded to think again. When Eire, France and Netherlands rejected the European Constitution, either the people's view was ignored or the people were asked to vote again until, in the form of the Lisbon Treaty, the European Constitution was approved. With all this in mind, we now need to turn our attention to the analysis of strengths and weaknesses. In any negotiation, it is essential to draw up a clearly defined list of strengths and weaknesses before initiating the negotiating process. Such a list must focus tightly on the strengths and weaknesses in relation to the negotiation. Each side may have outstanding strengths of weaknesses in a general sense but we are interest only on those that are directly related to the negotiation issue. The point of drawing up such a list is to help us to use our strengths to best advantage and to minimise our weaknesses. We need to assess how strong we are in the negotiating process; and when, and on what negotiating issue, we should apply our greatest strength. We should use our strengths judiciously, reserving them for the attainment of core objectives. Disconnect between the UK's political establishment and the people. Victory of Leave over Remain (52% against 48%) definite, but not overwhelming. Disconnect in some member states between the Commission (an unelected bureaucracy) and the people. There is one other consideration of paramount importance. It is essential to recognise the general nature of the negotiation. Is it a negotiation where the core objective of the parties are aligned; or is it a negotiation where the core objectives are in conflict? In the former case, it is reasonable to assume goodwill on both sides and both parties can adopt a more conciliatory, compromising approach to negotiations. Good examples of such negotiations are joining a club or getting married. In the latter case (a conflict negotiation), the parties have to realise that they are in a zero sum game. Any advantage one side gains is at the expense of the interests of the other side. Good examples of this type of negotiation are leaving employment in a company to set up a rival organisation or getting divorced. In any negotiation, always be aware that the other party can walk away. (If they can't walk away, for them it's not a negotiation; it's a humiliation). Secondly, in a conflict negotiation, it’s difficult, if not impossible, to make everyone happy. In the UK/EU withdrawal negotiations, we find a clear example of a zero sum game. The UK wanted to leave; the EU wanted the UK to stay. The better the deal the UK negotiated, the worse it was for the interests of the EU. It was, essentially, a conflict negotiation. There were elements of the negotiation where there should have been a common interest. (It was to the benefit of both parties that trade should continue with the minimum of friction.) But the central issue, from the Commission's viewpoint, was that the UK had to be unequivocally worse off outside the EU, rather than in - perhaps even so much worse off that the result of the referendum could be reversed. In short, the UK's fist mistake was to misunderstand the essential nature of the negotiation. Having understood (or, in the case of the UK negotiators, misunderstood) the general nature of the negotiations, we need to identify the key players in the negotiation. Usually, this is easy. There are just two parties. In the case of the Brexit negotiations, the situation was far more complex. the Remainers, the opposition to Brexit in the UK: i.e. almost all the political establishment (including a majority in Parliament) and, of course almost half the UK population. As it turned out, the Remainers played a peculiar and pivotal role in the negotiations, a role examined in more detail in Sections7 and 8. Here we should simply note that the reluctance, if not the refusal, of the Remainers to accept the outcome of the referendum caused the UK Government to make yet another negotiating error. The people of the UK had been offered an "in/out" referendum. It was a clear binary choice, leading to a clear unilateral decision. But the UK Government was conscious that 48% of the electorate had voted to remain in the EU and that the UK establishment was wholly opposed to leaving. Teresa May, the British Prime Minister, heroically took on the task of negotiating our exit but, perhaps understandably, she made the mistake of trying to appease those who were opposed to Brexit, desperately looking for a middle way. She didn't seem to grasp that a binary choice had been made. She couldn't negotiate a deal that would please both Brexiteers and Remainers any more than a girl can be a little bit pregnant. In the end, her Chequers proposal and the Withdrawal Agreement pleased almost nobody. Her motion to approve the deal suffered the worst defeat in Parliamentary history. In the democracy of ancient Greece, a man's ability to influence others with his words was considered a matter of great importance. A politician's expertise in the civic art of rhetoric was viewed as a crucial and much-admired accomplishment. Today, it is just as important, although the key rhetorical techniques have changed. In the ancient world, the main rhetorical virtues were the ability to reason and to present a case eloquently. Today, it is the ability to encapsulate complex thoughts into simple words or phrases in order to persuade the listener to see things as the speaker wishes them to be seen. "Redundancies" become "downsizing", "outsourcing", "consolidating" or "rationalising".. Endless programme repeats on television become "another opportunity to see". "We are going to do something you don't like in future but not yet." becomes "We have no plans to do this thing you don't like." "With respect" means "I'm about to prove you're an idiot." "I hear what you say" means "When you've finished (which I hope is now), I'm going to give you my point of view which either contradicts what you've just said or completely ignores it". "I won't take any lessons from you" means "Yes, I may have messed up but you have messed up even more seriously in the past". In most of these examples the speakers are trying to shift the centre ground of the discussion in their favour. In all these cases, the speaker is defining the scope of the discussion and taking control of the language. Most arguments, and particularly political arguments, draw their energy from the battle to establish the scope of the debate. Most commonly it is about who succeeds in defining and then occupying "the middle ground". The Brexit negotiations furnish some rather good examples of defining the scope of the discussion and taking control of the language, most but not all from the Remainers' side of the argument. The first and blatantly obvious definition of the scope came from the EU which refused to discuss the future trading relationship with the UK until the UK had signed, sealed and delivered a Withdrawal Agreement. This was an absurd stipulation, if only on the grounds that the UK could not know whether it could afford to pay the EU's demands for money before it knew how much damage the EU intended to inflict on the UK economy. It also meant that, if the UK accepted this stipulation, it would have to surrender most of its bargaining strengths before any free trade talks could take place, thus ensuring that the UK would be in a weak bargaining position whenever the free trade talks eventually started. Another example of defining the scope was the introduction of the concept of a "hard and soft Brexit". From the Leavers' viewpoint, there was only one Brexit which they defined as "Taking control of our borders, our laws and our money". This slogan was in itself an attempt by the Brexiteers to define the centre ground of the debate. When the Remainers introduced the soft Brexit option, they shifted the ground away from a clear break with the European Union towards half a break or a quarter of a break or no break at all At the start of negotiations, Teresa May attempted to hold to a genuine Brexit, with her famous red lines. But the Remainers were determined to dilute Brexit to the point where there would be no substance to the word. They argued that the UK should remain within the Customs Union (which would mean the UK could not have an independent trading policy). Then some of them argued we should also stay in the Single Market which would have meant the UK would have to accept the EU's four freedoms. At the extreme Soft Brexit, Remainers were arguing the absurd proposition that the UK would remain tied to the European Union, subject to all its rules, still paying to support the institution but with no say in how the EU was run or what it did. This was clearly a far worse option than staying in the EU which was, after all, the Remainers' real objective. The Brexiteers hit back by saying the Remainers were trying to put the UK in the position of a "vassal state" which gained some traction with the public (at least that part of it which knew what 'vassal' meant) but less so with Parliament and the media. you are happy to accept whatever terms the other side deigns to offer. The Remainers failed to understand that, if you "take no deal off the table", as they continually demanded, the negotiation is over. You have nothing to negotiate with. Toward the end of the negotiation, there was much debate about the possibility of the UK leaving without a deal. This possibility was almost universally described as "crashing out" and the effects as "catastrophic" and "disastrous". While there would no doubt be serious problems with leaving without a deal, especially as it seemed the UK Government was ill-prepared for such an eventuality, the language of "crashing out", "catastrophe" and "disaster" was calculated to close down any serious consideration of the possibility. After all, who would seriously consider wilfully causing a "catastrophe". The Remainers firmly occupied the centre ground and those who simply argued that we should leave the EU (which was the option the UK population had voted for) were cast as extremists. In the battle for establishing where the centre ground lay, the Remainers, with the help of the British establishment, were the clear victors, moving Virtual Remain to the centre ground and portraying Clean Brexit as extreme. The EU is a project which is rather (and, in some cases, far) more popular with the political establishment of the member states than it is with their publics. In Italy a majority of the people are sceptical about the benefits of EU membership. Even in France which, through the CAP and the status it enjoys, benefits greatly from the union, President Macron has said that if they held a referendum on EU membership, the country would probably vote to leave. Clearly the UK's decision to depart was a serious blow to the project itself, a blow felt most acutely by the EU Commission to whom it seemed the UK's departure posed a threat to their very existence. They insisted that, before any discussion of any future trading relationship, there must be a full, legally-binding agreement on the terms of the UK's departure. Following on from their first mistake (the assumption this was a non-conflict negotiation), the UK negotiators made their second catastrophic mistake. They agreed to the EU's pre-negotiation terms. Why was this a catastrophic mistake? Because it broke one of the fundamental rules of negotiating: i.e. to focus the negotiation on your own objective. The UK had decided to leave the EU. Essentially what it wanted from the EU was a free trade deal. Of course, it also wanted good relations with the EU on a bi-lateral (i.e. UK/EU basis) in many areas but the key to a successful negotiation for the UK was a free trade deal. So the EU negotiators said they wouldn't even discuss future trading arrangements until the Withdrawal Agreement had been signed. Instead the UK agreed to proceed on the basis stipulated by the Commission. Why? Were they forced to accept the Commission's terms? No. They could have walked away and taken two years to prepare for an orderly exit on WTO terms. So why did they do it? Because the UK negotiators misread the nature of the negotiation; they failed to understand it was conflict negotiation. They adopted a conciliatory approach, apparently believing that by giving the Commission what it wanted at the beginning, they could be sure the Commission would be more reasonable and generous later in the process. Instead, of course, the EU negotiators logged each concession as a victory and clear evidence that the UK would give in to their every demand. That was a perfectly reasonable conclusion for the Commission to draw from the UK's conduct of the negotiations. No doubt the UK negotiators did their best to win small victories in the interminable grappling with the minutiae of the Withdrawal Agreement but they had little success. If you study the Withdrawal Agreement (some 585 pages), you will find it reads like an EU wish-list, rather than a well-balanced, fairly negotiated agreement. It is predominantly about the UK's continuing obligations and how much the UK will still have to pay. There is almost no element of reciprocity. But the failure of the UK negotiators to achieve a balanced Withdrawal Agreement is as nothing compared to their catastrophic error in allowing themselves to be diverted from their own core objective. Which brings us to the third mistake made by the UK negotiators. They agreed to pay substantial sums of money to the EU without attaining any of their own objectives. Although not legally obliged to pay anything for leaving the EU, they agreed to pay £39 billion. This was a contribution to the running costs of the EU after the UK had left, during a period when the UK would have no say in what the EU was doing or spending. The UK also agreed to pay further billions of pounds for a transition period in which again the UK would have no say in the EU’s decisions but would still be subject to EU law and rules. Were these concessions necessary? No. Why did the UK make them? We come to the fourth mistake and to the role of the Remainers. The Brexit negotiations were unusual in that one of the parties (the UK) was bitterly divided over the objective. 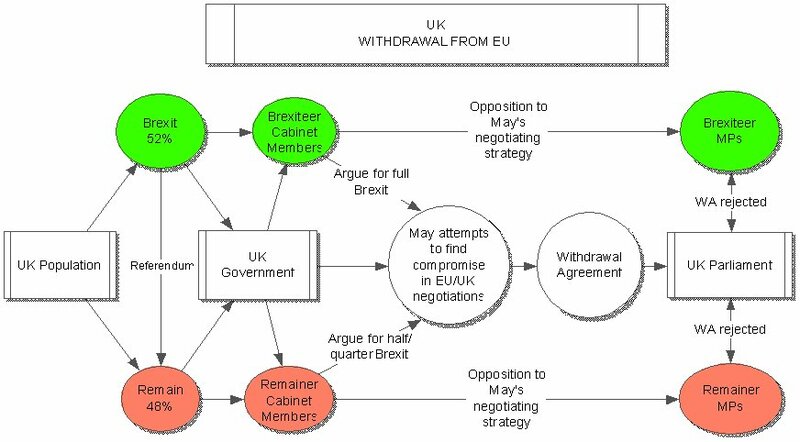 This diagram below shows that, throughout the negotiating process, those who wanted to remain within the EU (the Remainers) continued to press their case directly with the UK Government and indirectly with the EU Commission, despite the result of the 2016 referendum. As we have stated earlier, to succeed in any negotiation you need to focus on clearly defined objectives. The referendum, albeit by a relatively small margin, clearly set an objective - for the UK to leave the EU. Teresa May's Government undertook the task of negotiating the UK's departure. But for the UK to succeed in the ensuing negotiations, it was necessary that the whole country (the Government, Parliament and people) should unite behind the negotiating team to achieve the best possible terms from the EU. The opposite happened. From the moment the result was announced, the Remainers undertook to negotiate with the Government, effectively on behalf of the EU. They argued that we should show good will to the EU by immediately guaranteeing full rights (which are as good or better in the UK than anywhere in the EU) to all EU citizens living in the UK without making such an offer conditional on reciprocal arrangements for UK citizens living in the EU. Remainers described the requirement for a reciprocal arrangement as blackmail. It was extraordinary that a perfectly reasonable offer designed to provide UK citizens in the EU with the same protection we were offering EU citizens in the UK should have been the subject of vitriolic criticism. It was doubly astonishing in that the UK had at least three times as many EU citizens in the UK as the EU had British citizens in the EU, and was therefore making an extremely favourable offer to the EU. After all the UK has a generous welfare system and the only completely free national health service. Then the Remainers objected to Teresa May's dictum that "no deal was better than a bad deal", thus ignoring the first principle of negotiating (i.e. if you can't walk away from a deal you have no power at all in the negotiation). If you can never say No, in the end you have to say Yes to whatever you are offered. This schism between the Brexiteers and the Remainers continued throughout the process. As we have previously noted, the UK Government then made several egregious negotiating errors but at the heart of the failure of the UK Government to achieve an equitable deal was the determination of the Remainers to keep the UK as a member of the EU in all but name. Remainers argued for UK membership of the Customs Union, thus precluding the UK from making free trade deals on its own behalf; and for UK membership of the Single Market, thus effectively compelling the UK to accept the EU's four freedoms, despite knowing we would have relinquished any right to contribute to the EU decision-taking process. Clearly the outcome was a deal far worse than staying in the EU which, as we have noted elsewhere, was precisely what the EU negotiators intended. In other words, consciously or unconsciously, the Remainers did everything in their power to ensure the UK would be offered the worst possible deal. They were so determined to subvert the outcome of the referendum that they proved a more effective antagonist to Teresa May and the UK negotiating team than the EU Commission itself. On what grounds has Labour opposed the Withdrawal Agreement, given that it offers them, possibly in perpetuity, what they are asking for? How much better off will the UK Government be if we adopt World Trade terms and the EU has to pay WTO tariffs on their exports to the UK, which are twice the value of our exports to the EU? Andrew Neill has attempted to apply some critical thinking to the issue from time to time, but the media in general have demonstrated that they really aren’t up to dealing with complex issues. False statements remain unchallenged. Inconsistencies aren’t even remarked upon, much less criticised. MPs have been allowed strut and posture in a world of their own while business and ordinary people have been abandoned in the real world in a state of bewilderment and uncertainty. The only ones to come out of this with any credit are the British people who responded enthusiastically to an invitation to take a decision and have so far shown remarkable restraint, despite the refusal or inability of Parliament to carry out their instructions. The article written by Paul: Analysis and critique of Brexit negotiations is an accurate description of history - much to be learned from it. Not only the way to negotiate successfully, but also the nature and anatomy of democracy. It has been said that, in true democracy, the losers accept the validity of the outcome of an election without condition. Paul's article clearly demonstrate that this is not the case relating to Brexit. All the trimmings and formalities of democracy are evident and employed in the political discussions relating to Brexit, except the nature of true democracy. 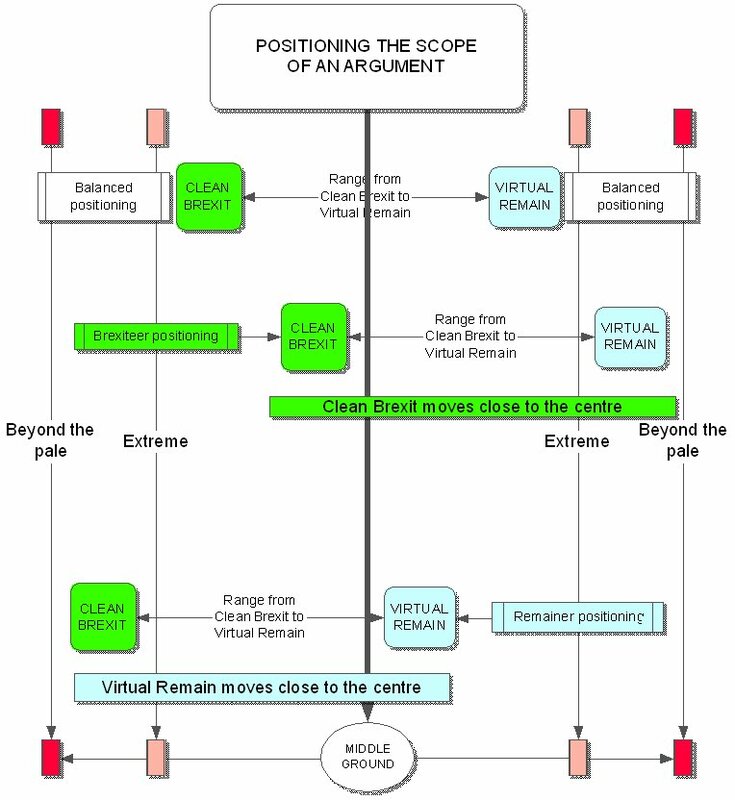 Paul has just described the anatomy of a virtual democracy. The article should be sent to the head of the Civil Service and should be widely available and discussed in the media.